Historical Clock by Eberhard & Co. auctioned. The historic pocket watches Magini Sistema model of Eberhard & Co. The historic pocket watches Magini Sistema model of Eberhard & Co. has been at an auction of the Italian auction house auctioned off Casa D’Aste Meeting Art for € 56,000. 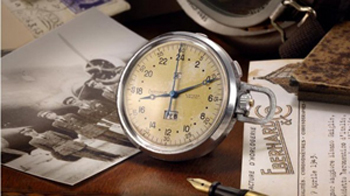 The split-seconds chronograph Sistema Magini was made by Eberhard & Co. in the early 1940s and was used by the pilots of his time in World War II as a timepiece. Example, flew back the clock in the pocket of a pilot about 1942 from Rome to Tokyo. Now, the timepiece was bought by an anonymous bidder. Although simple model of the ten automatic watches and ten split-seconds chronograph have been ordered, this project was never realized. Thus, it is at the Eberhard & Co. Sistema Magini a real historical kind. The Clock comes in a metal case with a crown made of chrome and a yellow-colored dial with dark blue central pointers. Admittedly, the case looks pretty worn out, but that’s the excitement of this Pocket no harm. In addition to the central time display, the clock can also identify the date and month. Apart from the minute scale the Clock has a 24-hour scale on the outer edge. Means that the pointer does not turn two, but only once a day. Should the pilot to quickly legibility are guaranteed. The automatic movement with manual winding is received correctly. This reflects the know-how of the Swiss watch industry. Eberhard & Co. should benefit from the reputation of his historical model watches Sistema Magini might still benefit today.